Leigh Richardson of Leigh Designs is an extraordinary painter. At each show she delights us with an entirely new series of 8 coordinating designs. I have huge respect for her talent and her nerve with the all or nothing attitude. Sometimes she picks a theme and I love every canvas more than the next. Thank you Leigh for the Guadalajara Series and sometimes she picks a theme that while I am impressed I don’t want to live with them. As an artist she never plays it safe. In January Leigh introduced the Shogun Series – the Warriors of Ancient Japan. Each is more dramatic than the next. 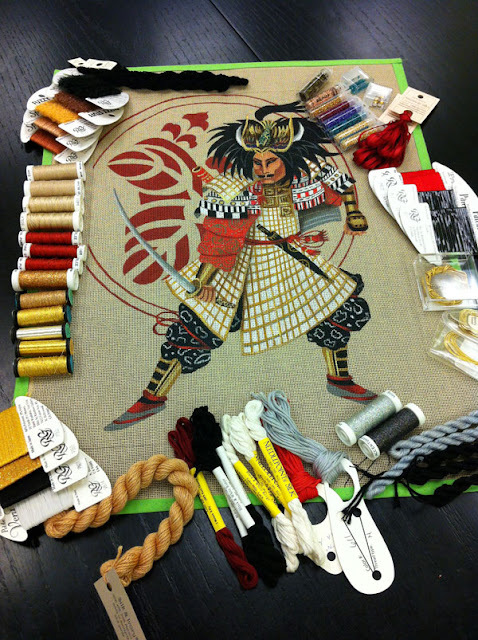 One of our customers asked us to stitchguide Otomaro for her. So, after much waiting the guide is complete. There’s all kinds of cool things going on in this canvas. I do hope we get to see a picture when it is finished. The quilted robes and the gold couching are going to be great. 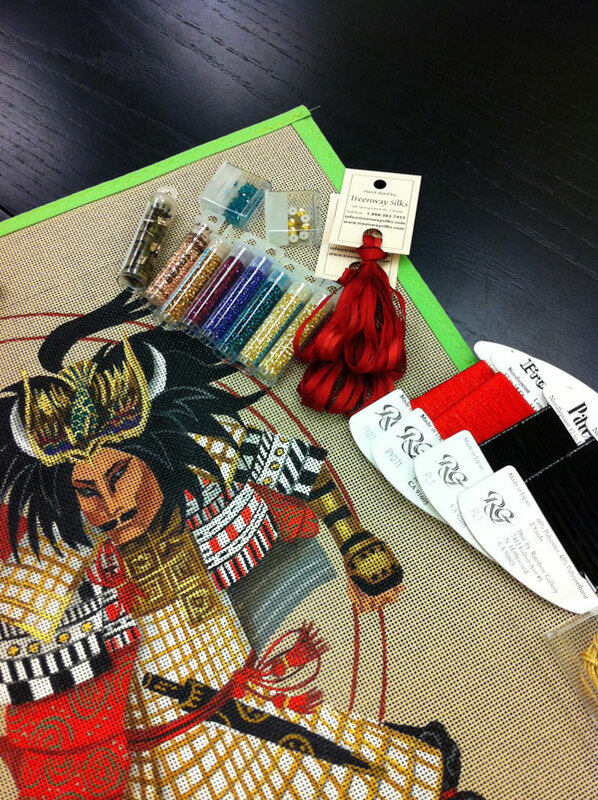 Here’s the beautiful threads that she will be stitching with. You know I need lots of pretty beads. This is the perfect canvas for the new Miyuki Tila beads. Totally outside my normal comfort zone of canvases. This one is going to be stunning when complete. I think I am equally excited about the background. If you would like to stitch Otomaro for yourself please call us or order on line and we’ll take care of the details. Yorimoto was fabulous fun from his background to his elaborate armor. I am sure this will be wonderful, too.